Tired of the scorching summer heat? Want to escape for a short break somewhere cool and adventurous? Then these Under 10k Summer Weekend Getaways are worth trying out. All of these mini vacations can be planned out by travelling on a friday late evening and coming back early monday morning. Probably one of the best Under 10k Summer Weekend Getaways from Delhi. Off season travel means pretty much all the rates, stay cost and crowd will be on the lower side making it the perfect budget travel. From paragliding to cable car rides, skiing and more, this place is a summer paradise for adventure seekers. May is the best time to travel. As the months after, the weather gets pretty rough and unpredictable with the onset of monsoons. If you wish to travel on a budget, stay is where you really can save up some moolah. Homestays are great for such holidays where they ensure basic amenities, a clean house and low costs. RedBus has government buses running everyday from Delhi ISBT to Manali. A one way trip costs approx INR 1400. So for a couple travel cost will be around INR 6000. Further a round trip to Solang and back is another INR 1200. Bonus: You also get to hang out in Manali after you complete your Solang adventures. Also houses the mini Switzerland of India in a nearby village called Khajjar. This beautiful summer retreat in the hills is perfect for nature lovers. 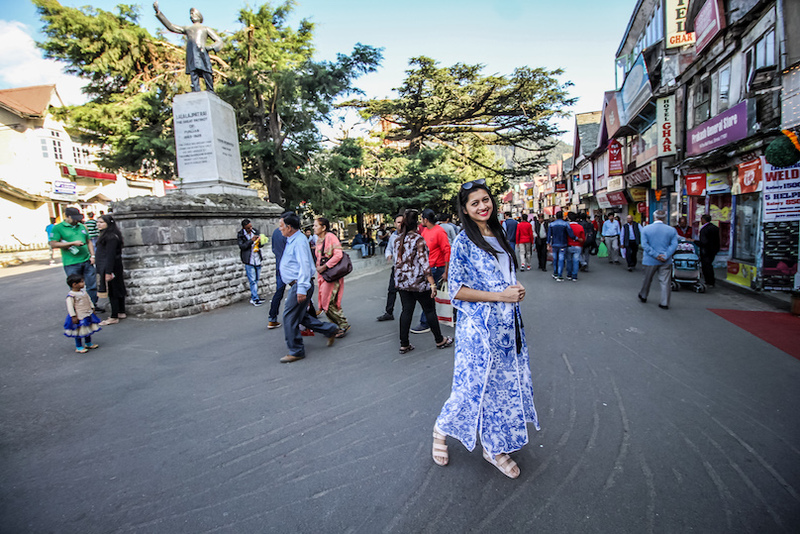 From gorgeous mountain peak treks to waterfalls, ancient European churches and more, Dalhousie is worth spending a weekend at. Here’s a detailed itinerary of what to do at Dalhousie if you want a elaborate list of things to see and do. Red Bus has government buses running everyday. It is an approx 10 hour travel and costs roughly about INR 1550 one way. The good thing about Dalhousie is that it is close to other popular destinations like Dharamshala and Mcleodganj. You can even choose to stay in a place which is midway to these locations and try doing more than just Dalhousie. Although I think one destination at a time makes more sense. Whether you like trekking, camping, paragliding or just want a quite meditative summer retreat, this is the place to go to. Do check out the paragliding sessions at Bir Billing. It is at a distance of 65kms but the views are breathtaking. Charges start at INR 1500 for a 20 min paragliding experience. Can you see the picture above? Doesn’t it already make you want to plan this out? The journey from Delhi to Dharmsala takes about 11 hours by road. Daily buses run from Delhi ISBT costing anywhere between INR 600 to INR 1400 one way. One of the recent popular destinations in Uttarakhand, Chakrata happens to be an old cantonment area in the Dehradun district. Ideally winters are the time to check out this paradise. But it also makes for an appealing summer retreat in the hills. There aren’t much activity based adventures to do here, but it makes for a stunning picture postcard weekend getaway. Check out my detailed review about Chakrata here. Bonus, here are some gorgeous photos from my trip to Koti Kanasar. Chakrata is a about 90 kms, 2.5 hours distance from main city Dehradun. Since it is a cantonment area, there aren’t any hotels/homestays in Chakrata. The only ones available are goverment or forest stay retreats which are not open to public. What you can instead do is do a to and fro from Doon. I prefer trains to buses for Dehradun. Shatabdi takes around 5 hours to reach the destination. There are multiple time slots to choose from. The average cost for the travel varies from INR 500 to INR 2500 depending upon the luxury you seek. You also have state run buses which take anywhere from 7 to 10 hours depending upon the time of departure. What I would recommend is to hire a car for a day or two day ride to Mussoorie, Chakrata and Koti Kanasar. The taxi might be a bit steep at around INR 2500 or so for a day. But it is well worth it for the beautiful drive through the hills. Do you have any other good recommendations for a budget Summer Weekend Getaway?